also how can i share these listing on facebook or gumtree? On the Closed Listings page, you can use the filter to view only "unsold" items. Just click the filter that says "Any" and then select the "unsold" option. On your second point, yes you can definitely store your listings in Auctiva so that you can list them at a later time. Any time you create and post a listing from Auctiva, it's automatically stored for you as a Saved Listing and is saved year over year. If you'd like to store your listings that recently ended, you can do so as well. From the Closed Listings page in Auctiva, select the listings you want to save. Then click the "Import Listings" button. After you click the "Import Listings" button, the import may take a few seconds to a few minutes to complete. Once the import completes, you'll then find all of those listings on your Saved Listings page, and can then relist them at a later time. If you'd like to share your listing on Facebook, you can use the Facebook share button that's located directly on the Active Listings page. If you'd like some additional help getting your Auctiva account set up you can email our team at any time here. We also host a live Auctiva 101 Webinar every 2 weeks where you'll receive a tour of the Auctiva website and feature demonstrations. Plus a live representative will be there to answer any questions you have. Additionally, if you're subscribed to the Elite or Pro plan, you'll have access to the Live Chat & Phone Support feature and can call us any time Mon-Fri 9am - 6pm PST. Please let me know if you have any more questions, I'm glad to help! Also how can I advertise my listings elsewhere so they can click on item and be directed to my eBay store ? If you're not seeing all of your ended listings on the Closed Listings page, you may need to adjust the filter at the very top of the page. Just click the drop down menu and select "90" days or "All". To market your products, I'd suggest you use your free Auctiva Emporium Storefront! 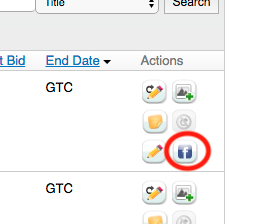 In your Auctiva account, click directly on the "Stores" button located in the top navigation bar. You'll then see a link to your "My Emporium Domain"
This is a free Emporium Storefront that Auctiva provides for your eBay listings and is a great way to market your products, plus you can customize it to match your branding and promote your business. Currently, each Auctiva account can only be linked to 1 eBay account. If you'd like to use Auctiva with a different eBay account, you'll need to create a separate Auctiva account for it. Again, please let me know if you have any further questions, I'm always glad to help. Can I change my user name to OzPickersWardrobe? To understand why the "kid clothing" listings are not appearing in your Auctiva account, our expert Customer Support Team will need to take a look. Please file a support case with our Customer Support Team here. They'll be able to take a closer look at your account and provide you with the right help.